Comments: Delia Bosworth (Nee: Dudley) | Sherborn MA USA | 1921-1940 | Comments: This is the only existing picture I have of my GGrandmother Delia Dudley Bosworth. Later years she would marry again, George Fairbanks. 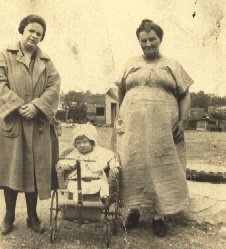 The other woman in the picture is my grandmother Vernie Julian Bosworth and the child is my Aunt, Helen May Bosworth. My Aunt would later in years marry into the Keddy family of Nova Scotia. I believe this photo was taken in Sherborn MA.